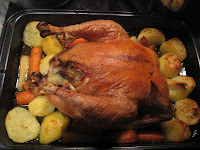 Yesterday I roasted a chicken and some vegetables for Sunday lunch. My good friend John was visiting and doing a few jobs for me. In exchange I cook ! 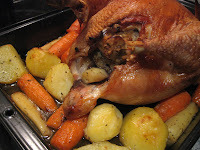 The chicken was a free range, almost organic one from The Friendly Farmer who has a farm near Athenry. 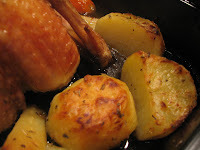 I like to sometimes cook the entire roast dinner in the roasting tray - it saves on electric, time and effort ! I pre cook the vegetables in slightly salted water until they are almost cooked. Then drain them well. both the chicken and all the vegetables well. This means that they food is cooked in olive oil and is also flavoured with heavenly Provencal herbs. I also stuffed the chicken with sage and onion stuffing (packet mix from Paxo - very good taste and texture and not expensive). Needless to say it was delicious and extremely easy to prepare and cook. Nice to meet you dkchristi and thank you so much for your very kind comments about my blog. I have copied your post above and made it into a comment on the Ghost Orchid post itself, as I thought other readers would be more likely to find it there and be interested. I will have a look at your book as soon as I can - thank you for sharing.